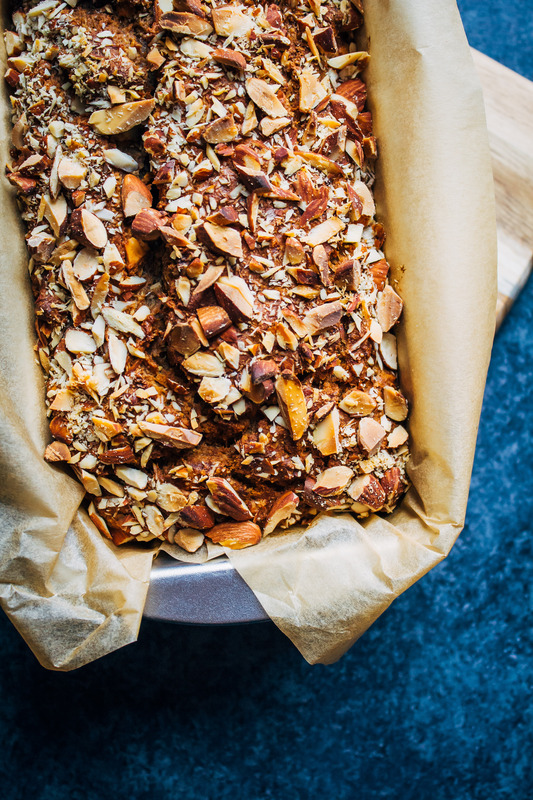 This Vegan Almond Banana Bread is cozy, delicious, and made with healthy, whole food ingredients! I’ve partnered with One Degree Organics to bring you this delicious recipe today. All opinions are my own. 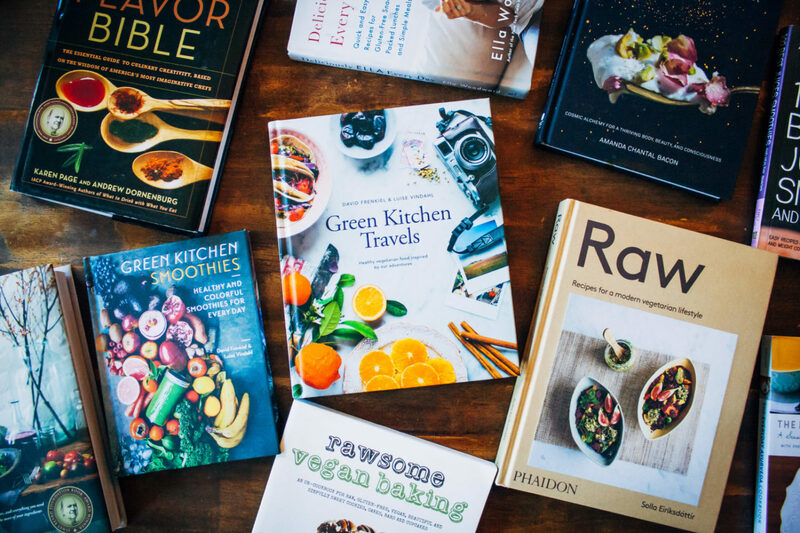 Thank you for supporting the brands that support Well and Full! In Nutrition News, a new study was published in the Journal of the American Medical Association (JAMA) that found a correlation between various dietary factors and the incidence of heart disease, Type II Diabetes, and stroke. The study examined the diets of Americans (as recorded in the National Health and Nutrition Examination Surveys from 1999-2002 and 2009-2012), and looked for a correlation between their diets and the various diseases listed above. Essentially, what the researchers found is that those who consumed higher levels of sodium, processed meat, sugary drinks, and red meat had a higher incidence of the listed diseases. The limitations of this study, of course, should be mentioned – as an observational study, this analysis doesn’t tell us anything about the underlying biochemical mechanisms that caused these results. However, does this mean that this study is worthless? Absolutely not. I read a Yahoo article discussing this new study, and the comments section was extremely disheartening. Comments ranged from “Nobody dies healthy, so enjoy it while you can,” to “My grandfather ate bacon and butter and he lived until 89, etc. etc.” There are two problems with statements like these. First, diseases such as heart disease, diabetes, and stroke don’t happen overnight. In most cases, they are a result of many years of a poor diet coupled with genetic factors. Second, knowing one person who continuously ate the unhealthy foods from the study and turned out fine has no statistical significance. Every single person’s physiology, biochemistry, and genetics are different, which is why scientists perform analyses on large populations of people, not just one person. Furthermore, this study speaks in terms of associations, not inevitabilities. It’s simply saying that if you eat high amounts of sodium, processed and red meats, and sugary drinks, you are statistically more likely to have heart disease, Type II Diabetes, and a stroke. However, I think there is some merit to the “enjoy it while you can” philosophy. While I’m definitely not recommending for anyone to drink sugary drinks every day and have absurdly high sodium levels, will one Coca-Cola kill you? No way. It’s all about moderation. Eating healthy isn’t about deprivation or being miserable. You have to keep your body and soul happy. So if that means breaking out a bag of chips every once in a while, go for it! Above all, do what’s right for you – and it’s going to be different for every one of us. Just remember, as always, to talk to your doctor before you start any dietary changes! 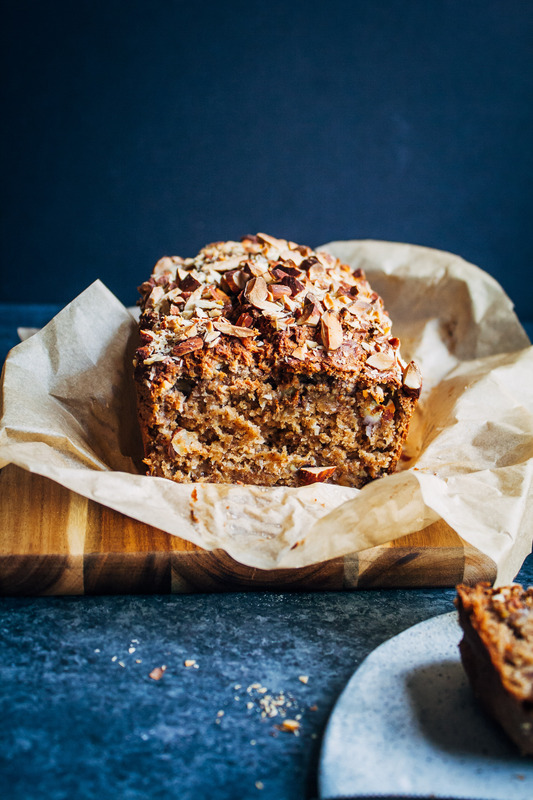 You'd never guess this vegan almond banana bread is made from plant-based, whole-food ingredients - it's sweet and delicious and goes perfectly with coffee! Start by mashing the bananas. Usually 5 bananas yields about 2 cups, but this will completely depend on the size of the bananas. In a bowl, add mashed bananas and all other wet ingredients. Mix until fully combined. In a separate bowl, mix together dry ingredients until everything is evenly combined. Pour wet ingredients into the bowl of dry ingredients, and mix until the batter is smooth and evenly combined. Pour batter into a bread loaf pan lined with parchment paper. Top with chopped almonds, if you like. Bake banana bread in the oven for about 30-40 minutes. 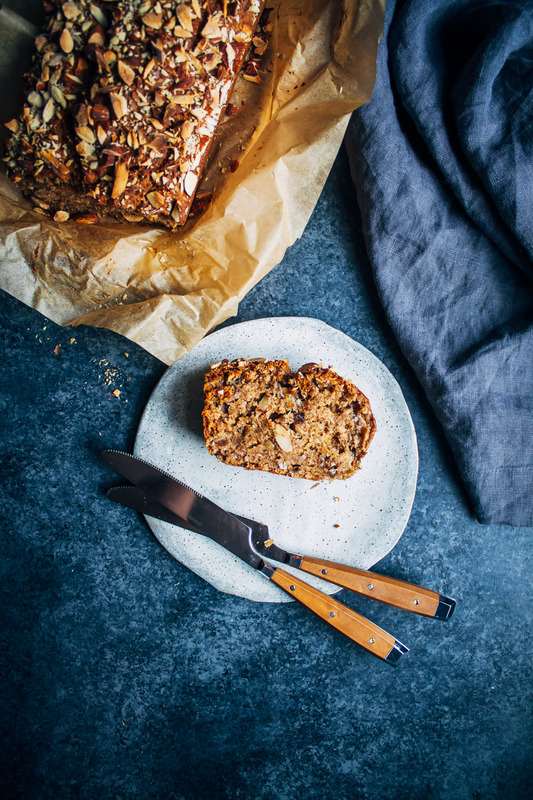 To test if the banana bread is fully cooked, stick a knife or toothpick in the center and see if it comes out clean. If any batter is still stuck on, continue cooking the bread for 5-10 minute intervals until it comes out clean. When the bread is done, let cool for a few minutes before slicing and serving. If you don't have spelt flour on hand, sub whole wheat. Also for this recipe I used a standard 9" x 5" loaf pan! “Eating healthy isn’t about deprivation or being miserable. You have to keep your body and soul happy.” Love that <3 also your photos are gorgeous! 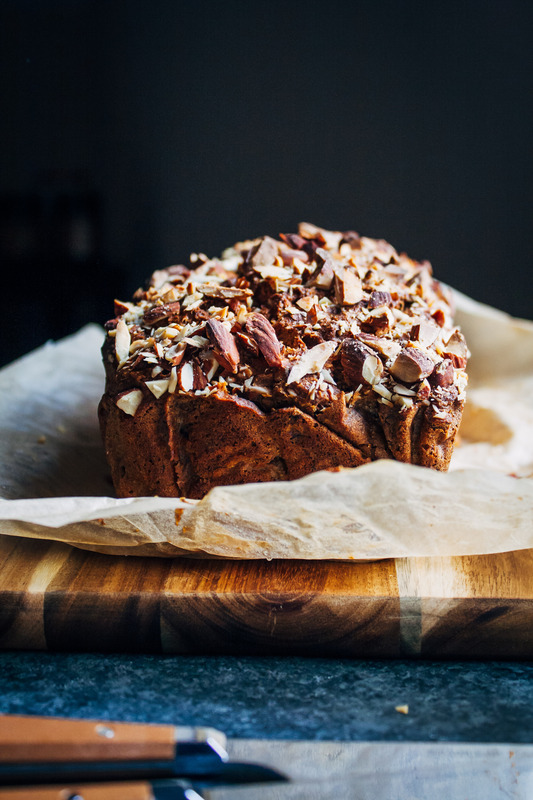 Made this tonight and it is hands down one of the best banana breads I’ve ever made!! This will be my go-to recipe from now on! Looks yum! I have been craving baked goods recently so I will have to try this! 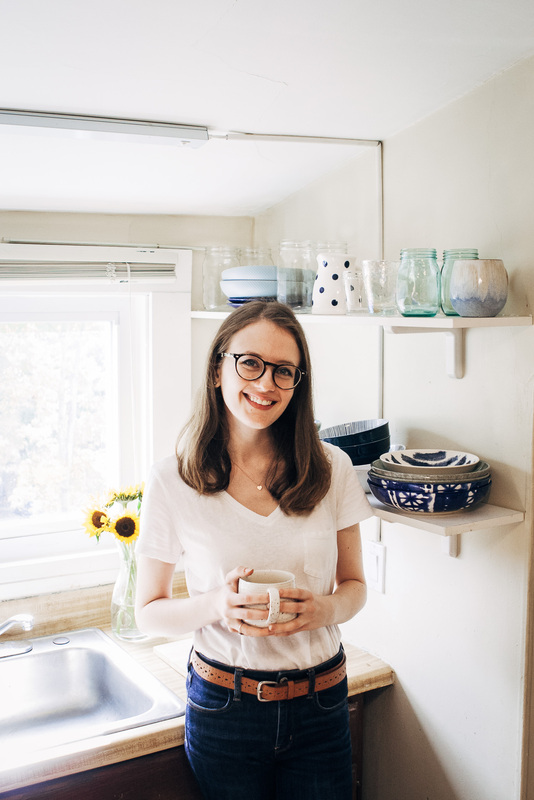 I also really appreciate all of your well-informed nutrition insight–while I try to be as “healthy” as possible, it feels like that pendulum is always swinging, so the “everything in moderation, including moderation” mentality is super helpful to me. Plus, who doesn’t like a handful (or two) of chips every now and then?! You’re preaching to the choir!! ;) I love a handful of chips ALL the time lol!! this bread is gorgeous. i like how you threw coffee in there….what a great idea! This looks to die for!! 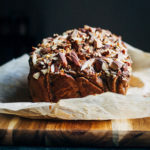 I’m a total banana bread lover any time, and add all that amazing crunchy goodness with the almonds on top, I wouldn’t be able to resist! I couldn’t agree more about how sad/annoying it is that vegan food is considered so alien at times…I always hear people say it’s not “real” food. You’d think food that grow in the ground would be considered more “real” than all the processed, horrible stuff a lot of people eat daily. Keep up the great work and we can spread the word with beautiful recipes like these that this food is DELISH! YES – whole, vegan food is WAY more “real” than all that processed stuff that’s so ubiquitous in our society. Right on, Sara! Do you by any chance know the nutritional info for this almond banana bread? Amen! I was diagnosed with severe congested heart failure November 2016. Was put on some strong meds, a dose for a 400lb man. I’m no way near that description, an overweight female but not that overweight. Had to reevaluate my life or risk surgery or worst death. I first went off red meat, then pork, followed by all meat and then complete plant-based August 2017. Started to meditate at least once a day, walk, yoga and a little swimming. My meds are half what they were and I just received my latest cardiac MRI last week. My heart is back to a normal range, I’ve been in tears, tears of relief, since then. In my kitchen, the loaf pans seem to have mated and now have several sizes. What size loaf pan are you using? Can’t wait to try this. What could you substitute for the coffee?